I’ve just been given a sneak preview of a new Presence sound bank that a third-party developer has been making and it sounds really nice… Not sure when it will be on the market, it’s a work in progress, but I personally can’t wait to have it. People keep asking me about new sounds for Presence – I guess a lot of people don’t realise that Presence is basically a sophisticated SoundFont player, so any sounds in that format should work great with it. So there are already a huge amount of sounds available if you know where to look. My personal favorite place is Digital Sound Factory. These guys are ex-Emu developers, and they have pretty much the entire Emu sampler and Proteus module library available as SoundFonts, which can be dragged and dropped directly from the Studio One browser into Presence. I have a ton of these sounds and they are killer, highly recommended. The Proteus Pack especially is ridiculous value for money: 3,500 Proteus instruments for $99! That’s a no-brainer if you want to increase your library fast. Anyone know of any other good resources like this? Astonishingly I actually have a (more or less) free weekend, so am currently on a train from Munich to Stuttgart with my PreSonus headphones plugged into my iPad, writing new songs on the rather wonderful Korg iMS20 and iElectribe apps. I am sure I have mentioned these before, but just to reiterate: I freakin’ love these programs. They are bringing me back to my youth when all I had was a couple of analog synths and basic sequencers to write on. And as much as I have criticised the iPad in the past for various reasons, I have to confess that with the installation of these apps it really does become a magnificent mobile compositional tool. The really cool part that as soon as I get to an Internet connection I can upload to Soundcloud the .wav files of the rhythm tracks I just made and when I turn my computer on they will be waiting for me inside Studio One’s Browser, ready to have vocals and guitars added to them, thanks to the Soundcloud integration added in Studio One 2.0. Technology. It’s a wonderful thing when it’s done right. OBEDIA Announces Training Deal for Studio One 2 Users! Good news everyone! If you buy (or upgrade to) Studio One 2 Producer or Pro before the end of 2011, you’re entitled to some free training from OBEDIA! OBEDIA is a rad company that ‘s all about making your gear work FOR you instead of against you. “Obedient media,” see what they did there? Their training is fun, concise, and above all informative. It makes even the expert-level functionality of the software easy-to-understand. OBEDIA videos have mined all the fun of the Pirates of the Caribbean movies and all the information of Carl Sagan’s “Cosmos,” and compressed it all into sparkly 6-minute infotainment diamonds. Am at the Music Production Show in London today, which is being held in the rather bizarre environment of Arsenal Football Stadium. It’s kind of weird to look out the windows beside our booth and see an enormous soccer stadium standing empty. Was also pretty weird using the VIP parking area under the ground itself that is normally kept for visiting teams and managers, and have a guide to walk me around the staff areas of the place. The show itself has been buzzing, met up with lots of PreSonus users and converted many more who weren’t beforehand. Good to see how many really happy users we have – and a big thank you to those that stopped by to say hello and hang out. Also just got the latest issue of Music Tech magazine – which features a two page review of Studio One 2.0 and a one and a half page review of the new Audiobox 1818 VSL interface. Both products earned a solid 9 out of 10 stars, so I’m pretty happy about that. They described Studio One as “evolving into one of the best DAWs around” with “…brilliantly simple workflow” which works for me; though I’d say “evolving into the best DAW around” and forget this “one of…” nonsense 🙂 Still, a more than acceptable review, thank you Music Tech! Crossgrade offers are weird things. From the perspective of someone who makes and sells software for a living I can’t really make up my mind whether they are just giving people a big discount or whether they are a good way of genuinely rewarding people who have gone out and invested in our industry. Either way, from your point of view as a user, they are often a hell of a good deal. So if you are reading this and are still using a DAW other than Studio One, or (more likely) know someone else who is, check out the Crossgrade offer at the bottom of the online store page. It’s pretty sweet. Haven’t been updating much in the past couple of weeks, because I’ve been on the road practically the entire time. Everyone wants to know more about Studio One 2.0 so I’ve been visiting some of our dealers in the North of England and Scotland training them in the new features of the software – big shoutout to the guys at Rubadub and GG Digital in Glasgow, and Soundware and Sounds Live in Newcastle. 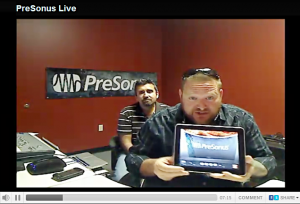 If you live up that way and need PreSonus gear, they are definitely the people to go to. Also been showing the new Audiobox VSL interfaces, which people seem to love (basically the guts of a StudioLive 1602 mixer in a rack at a great price, what’s not to like?). No, it’s not the zombie video again. Something we’ve been hyping lately is our Tech Talk Live series, which airs every Tuesday at 2pm CDT (19:00 GMT), broadcasting whatever cool ‘Sonus stuff is happening. It’s a stupendous opportunity to bask in the wisdom of luminaries like Brad Zell, Rick Naqvi, Justin Spence, and the occasional guest as they proffer up the shiniest dirt on all things PreSonus. Tune in and learn. Segundo: Our livecasts don’t quiiiite have the viewership we would like just now, and we want to up our view count! So, phone your dad and wake the neighbors! Tweet it out, Facebook message, rig up two-cans-and-a-string and pleasepleaseplease tell everyone you know to watch the next PreSonus Tech Talk Live. We will happily indulge your comments and questions, on-the-fly! Criticisms will be addressed begrudgingly. No, it’s not the zombie video again. Something we’ve been hyping lately is our Tech Talk Live series, which airs every Tuesday at 2pm CDT (19:00 GMT), broadcasting whatever (and from wherever) cool ‘Sonus stuff is happening. It’s a stupendous opportunity to bask in the wisdom of luminaries like Brad Zell, Rick Naqvi, Justin Spence, and the occasional guest as they proffer up the shiniest dirt on all things PreSonus. Tune in and learn. For those of you in Timmbucktwoistan or wherever, it’s possible that anytime PST isn’t exactly convenient. Know that all the past TTL videos are thoughtfully archived, and their Tzar’s wealth of knowledge can be accessed by you at any time.